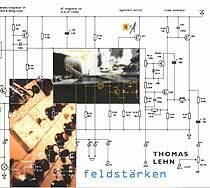 Thomas Lehn, EMS Synthi 'A' synthesizer. Tracks 1 and 11 recorded at home in Cologne on 29 July 1998; track 6 same location 28 July 1998; track 9 same location 21 October 1998; tracks 2, 3, 10 were recorded live on 19 May 1999 in Nancy at cine club de Saurupt during a simultaneous performance of films by Gaëlle Rouard, Christophe Auger and Xavier Quérel; track 4 was recorded live on 27 October 1999 in Munich at Echtzeithalle; tracks 5 and 7 were recorded live on 7 May 1997 in Krefeld at Dioton-Studio; and track 8 was recorded live on 6 September 1996 in Hamburg at G7. Cover photographs (reproduced above) Andreas Wagner and Peter Henseleit; cover design by SteyrerRenz Visuelle Konzepte & Realisation, Munich.